Anna Levesque is a world-class paddler, dedicated yogi and renowned instructor committed to enhancing the lives of women through kayaking, yoga and travel. Anna’s fifteen-plus years of experience as an accomplished international competitor, instructor and guide has placed her as the leading expert in her field. As a kayak athlete Anna was a member of the Canadian Freestyle Kayak Team from 1999 to 2003 and earned a bronze medal at the Freestyle World Championships in 2001. 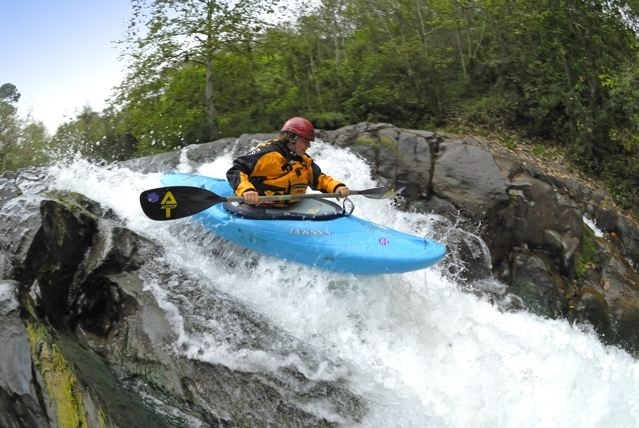 She placed in the top 3 in several freestyle competitions and extreme races during that time and has paddled in over 10 countries around the world. She is also a Yoga Alliance Registered Yoga Teacher who has accumulated 300 hours of teacher training and who has enhanced her personal practice over 15 years. Anna combines her expertise in kayaking with her experience as a student of yoga, meditation and personal transformation to provide a holistic, empowering experience for her students. She resides with her husband, accomplished paddler Andrew Holcombe, in Asheville, NC. Join her for a paddling and yoga retreat, class or trip and open up to the infinite possibilities that await you!